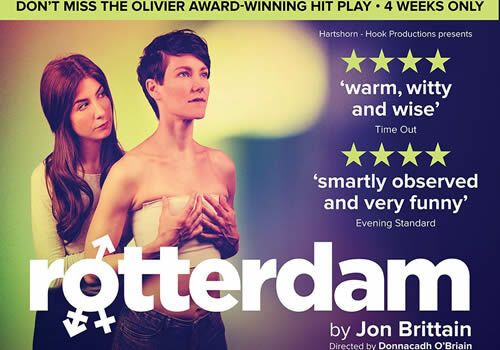 23 June 2017 - "Should be seen by all"
Jon Brittain’s Olivier Award-winning drama Rotterdam transfers to the West End’s Arts Theatre for a limited four week season. Following a critically acclaimed run at Trafalgar Studios in 2016, the production earned the award for Outstanding Achievement in an Affiliate Theatre at the 2017 ceremony. Rotterdam is the bittersweet comedy about gender and sexuality, following Alice, who wants to come out as a lesbian. Just as she plucks up the courage to send an email to her parents, her girlfriend Fiona reveals that she has always identified as a man. Now, she wants to start living as Adrian. As Adrian begins his transition, Alice is forced to consider if she’s straight. Premiering at Theatre503 in 2015, the pertinent drama features a cast including Anna Martine Freeman (The Nether) as Fiona/Adrian, Alice McCarthy (Boris: World King) as Alice, Ed Eales-White as Josh and Ellie Morris as Lelani. Directed by Donnacadh O’Briain (PEEP), Rotterdam features design by Ellan Parry, lighting design by Richard Williamson and sound design by Keegan Curran. Jon Brittain’s previous plays include A Super Happy Story (About Feeling Sad) and What Would Spock Do?, as well as directing Fringe Festival hit Maggie Thatcher Queen of Soho. After a sold-out run at Trafalgar Studios, Rotterdam plays a limited run at the Arts Theatre London from June 21st to July 15th 2017. Rotterdam is recommended for those aged 14 and up.